At one point in time, homeowners installed shutters to add an extra layer of privacy. However, these days, many homeowners tend to install shutters on the exterior of their homes for aesthetic purposes — although the extra privacy and shade are still important ancillary benefits. Let’s look at some of the biggest benefits of having shutter installed on your home. They’ll improve your home’s curb appeal. Do you dislike the way your home looks when you pull up in front of it? It’s probably because your curb appeal is likely missing something. You can improve curb appeal by painting your whole house or installing new windows. Nevertheless, you can also do it by having new shutters put on it. It’s a simple way to give your curb appeal a boost without spending a fortune. They’ll help you add a pop of color to your home. If your home looks a little bit blah right now, it could be because you don’t have enough color splashed across it. 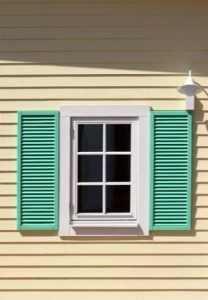 While you could change this by painting your home or installing a new colored roof, the simplest way to do it is by putting up new shutters. You can find shutters in many different colors, and they’ll instantly add a pop of color to any home without much effort on your part. They’ll make your home more valuable. When your home looks good, it’ll be more valuable to potential buyers. Whether you’re looking to put your home up on the market right now or not, you can increase the value of it by slapping some new shutters on it. As long as you choose the right color and call on an experienced siding company to handle installation, your shutters will bring your home’s value up and allow you to take more pride in it. Do you want to learn about some of the other benefits of installing shutters on a home? Roofing by Bruce can tell you all about them. Contact us at 570-424-8891 today to get the scoop on shutters and shutter installation.